Product prices and availability are accurate as of 2019-04-25 01:13:09 UTC and are subject to change. Any price and availability information displayed on http://www.amazon.com/ at the time of purchase will apply to the purchase of this product. 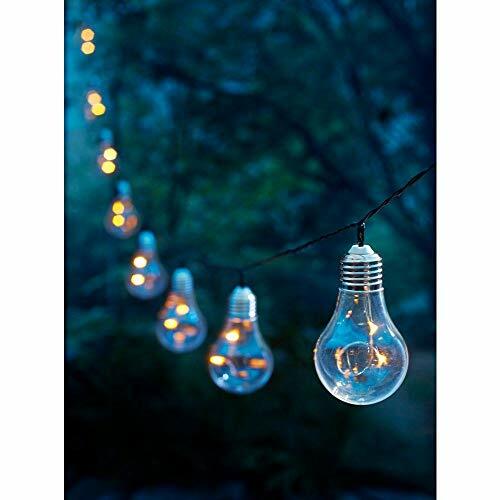 Bring a touch of retro style to your next evening barbecue or late-night pool party with these decorative string lights. Each of the ten plastic globes is styled like a bare incandescent bulb, creating the perfect accent for a vintage or urban industrial décor scheme. The bulbs are made of rugged plastic, eliminating the danger of broken glass for safe use in areas where children might run barefoot. Thanks to economical LED technology, a full battery charge powers the string lights for up to eight hours. The 15.42-foot cord (11.8 inches between bulbs and 6.5 feet between solar panel and first light) provides ample length for decoration. 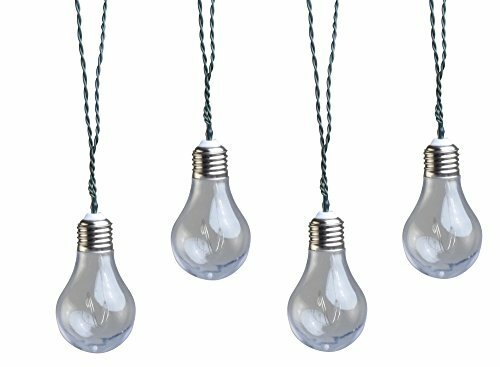 NOSTALGIC STYLE: Shaped like vintage incandescent bulbs, these string lights are a whimsical throwback to good times past. AMBIENT LIGHTING: The efficient LEDs provide a warm white glow for a cozy and welcoming atmosphere. EASY SETUP: The remote solar panel is easy to install by mounting on a wall, clipping to a deck umbrella, or staking in the ground.